[ABOVE] The trade plate of the Merrick photographic studio at 33 Western Road, Brighton, taken from the reverse of a carte-de-visite (c1865). "Merrick" was the trade name of Joseph Langridge, who operated as a photographer in Brighton from around 1856 to 1873. Joseph Langridge junior was born in Brighton in 1812, the son of Mary and Joseph Langridge, a pawnbroker and second-hand clothes dealer. ( Joseph Langridge the younger was baptised on 12th April 1812 at Brighton's Salem Chapel ). Joseph Langridge the elder (1782-1863), Joseph's father, originated from the village of West Firle, five miles south-east of Lewes. On 1st March 1809, Joseph Langridge senior married Mary Merricks (born c1787, Uckfield) at All Saints' Church in Lewes. [Joseph Langridge junior later used an adaptation of his mother's maiden name - "Merrick" - for the name of his photographic studio in Brighton). Joseph and Mary Langridge produced at least three children. Mary Ann Langridge, the couple's first child, was baptised on 24th July 1809 at the Salem Chapel, Bond Street, Brighton. Joseph Langridge junior arrived three years later in 1812 and was baptised at the same chapel in Bond Street. A second son named Franklin Langridge was born in 1815 (baptised at Salem Chapel, Bond Street, Brighton on 11th April 1815), but he died in 1844 at the age of twenty-nine. Joseph Langridge senior worked as a pawnbroker and second-hand clothes dealer in the area of Brighton known as "The Lanes". 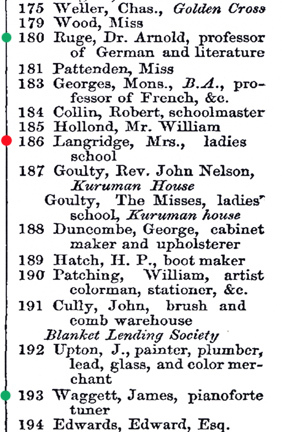 In early trade directories, Joseph Langridge senior's home and shop is listed at 30 Poplar Place, Brighton. Poplar Place was the name given to the northern end of Meeting House Lane, near Union Street. In the 1830s, Langridge's address was given variously as Union Street, 30 Poplar Place, 30 Meeting House Lane and No. 30 in The Lanes. During his early working life, Joseph Langridge the younger probably assisted his father in his pawn-broking activities, but by 1835 he had established his own silversmith and jeweller's business at his father's shop. An advertisement for "J. Langridge, Silversmith, Goldsmith and Jeweller, Dealer in London Manufactured Watches, Sheffield Plate, &c." appeared in The Brighton Patriot newspaper on 12th May 1835. The newspaper advertisement gives Joseph Langridge's business address as "No.30, In The Lanes", which indicates he was sharing his father's premises when he first set himself up as a jeweller and silversmith. In July 1837, Joseph Langridge junior purchased the lease on two shops in Brighton, one at 15 North Street, the other at 71 King's Road. By 1838, Langridge had transferred his jewellery and watch-making business to the North Street address and by the following year he had opened a second shop at 71 King's Road. At this time, Joseph Langridge was in partnership with Edward Weston, who probably provided the funds to purchase the equitable interest in the leases of the two properties. Mary Ann Langridge (born 1809, Brighton), Joseph Langridge's elder sister, married William John Faithfull (born 1802, Westminster), a solicitor's clerk, on 1st June 1835. In years to come, William John Faithfull was to play a part in Joseph Langridge junior's business dealings and two of William's sons, William Faithfull junior and Frederick Franklin Faithfull were to work as photographers in their uncle's photographic studio. In 1839, Joseph Langridge junior married Annie Ansell (born c1820, Hampstead), the nineteen year old daughter of Thomas Ansell of Hampstead, London [The marriage of Joseph Langridge and Ann Ansell was registered in the Edmonton District of Middlesex during the 2nd Quarter of 1839]. Annie Ansell Langridge, the couple's first child was born in Brighton the following year (Annie Ansell Langridge was baptised on 19th August 1840 at the Chapel Royal, Brighton). Joseph and Annie Langridge produced three more daughters over the next seven years - Mary Matilda Langridge (baptised at the Chapel Royal on 2nd February 1842), Kate Langridge (baptised on 9th March 1845) and Lucy Ellen Langridge who was born in 1846, but baptised with her cousin the following year on 31st March 1847. [ABOVE] An advertisement for Joseph Langridge, Silversmith, Goldsmith and Jeweller of No 30 The Lanes, Brighton which appeared in The Brighton Patriot on 12th May 1835. 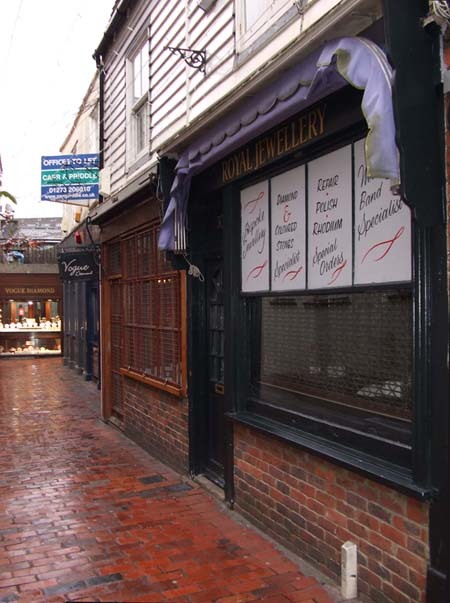 [ABOVE] A modern photograph of the shop at 30 Meeting House Lane, Brighton (2008). Joseph Langridge worked as a silversmith, goldsmith and jeweller at No 30 The Lanes (Meeting House Lane) between 1835 and 1838. The building at No 30 is still used as a silversmith and jeweller's shop today. (In 2009, Siverado, Jewellers). 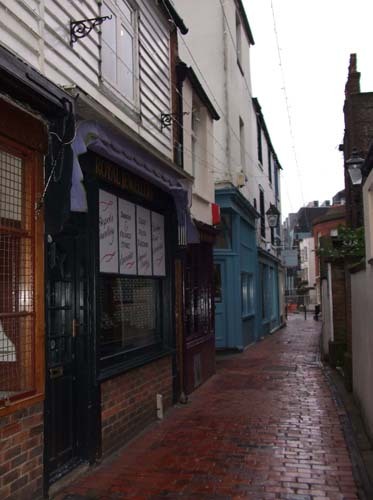 [ABOVE] A photograph of The Lanes in Brighton, today (2009). This view shows Meeting House Lane, looking south towards Prince Albert Street. Joseph Langridge senior, Joseph Langridge's father, worked as a pawnbroker and second-hand clothes dealer at No 30 Meeting House Lane in the 1830s. Langridge's business premises at No 30 Meeting House Lane is the shop with the white clapboard siding and black paintwork on the left of this picture. Joseph Langridge junior ran a silversmith & jeweller's business at No 30 The Lanes (Meeting House Lane) between 1835 and 1838. The building at No 30 is still used as a silversmith and jeweller's shop today. 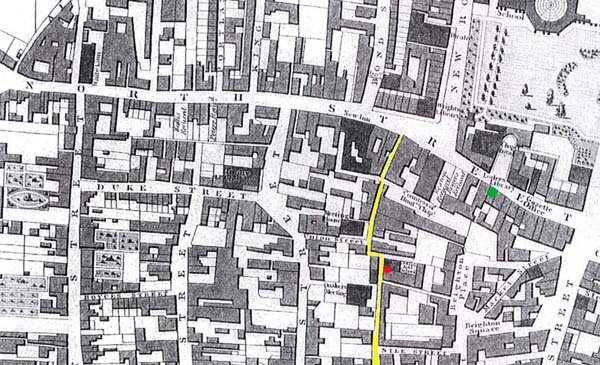 [ABOVE] An early Victorian map of central Brighton showing the location of Joseph Lengridge junior's businesses in The Lanes (marked in yellow) and North Street. Joseph Lengridge junior established a silversmith and jeweller's business at his father's shop at No. 30 "In the Lanes" (Meeting House Lane) around 1835. (The location of the shop at No. 30 is marked with a red dot). By 1837, Langridge had transferred his jewellery and watch-making business to 15 North Street (the location of this shop at No. 15 North Street is marked with a green dot). 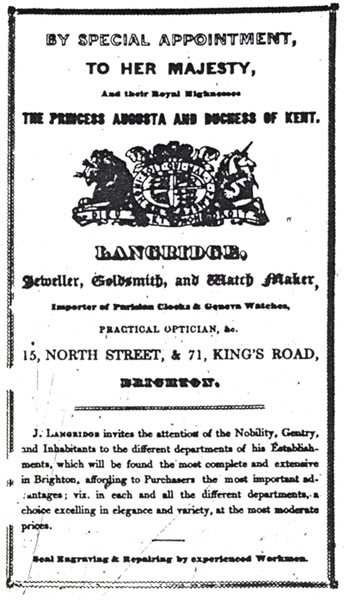 [ABOVE] An advertisement for Joseph Langridge junior, jeweller and spectacle maker of 15 North Street, Brighton which appeared in The Brighton Patriot on 6th November 1838. [ABOVE] A full-page advertisement for Joseph Langridge, Jeweller, Goldsmith and Watch Maker of 15 North Street & 71 King's Road, Brighton which appeared in Leppard & Co.'s Brighton Directory for 1839-40. On 22nd July 1842, Joseph Langridge junior, watchmaker of Brighton was summoned as an insolvent debtor to the Court House at Horsham. ABOVE] Joseph Langridge the younger, described as a former "Bread and Biscuit Baker" in an Insolvent Debtors notice. ( Hastings & St Leonards News, February 1851). [ABOVE] By 1835, Joseph Langridge, describing himself as "Jeweller to her Majesty and the Royal Family" had taken on the additional role of "practical optician" and was manufacturing spectacles at his business premises in North Street, Brighton. The above advertisement appeared in The Brighton Patriot on 6th November 1838. [ABOVE] An advertisement for "Brighton Bloaters" placed in The Brighton Herald by Joseph Langridge, of 203 Western Road, Brighton on 22nd October 1853. [ABOVE] The trade plate of the Merrick photographic studio at 33 Western Road, Brighton, taken from the reverse of a carte-de-visite (c1865). "Merrick" was the trading name of Joseph Langridge, who operated a photographic studio in Brighton from around 1856 to 1873. [ABOVE] The List of Subscribers to The Direct London and Brighton Railway (Rennie's Line) which was published by order of The House of Commons on 7th March 1837. Joseph Langridge, silversmith of Union Street, Brighton (marked with a red line) is shown as a purchaser of twenty-five railway shares valued at � 1,875. Joseph Langridge's signature was witnessed by Franklin Langridge, Joseph's younger brother. [ABOVE] "View of the Railway Terminus, Brighton" by Richard H. Nibbs (1816-1893), a print published in the early 1850s. The Brighton Railway Station House was designed by David Mocatta (1806-1882) and opened to the public when the London to Brighton Railway Line was completed in September 1841. 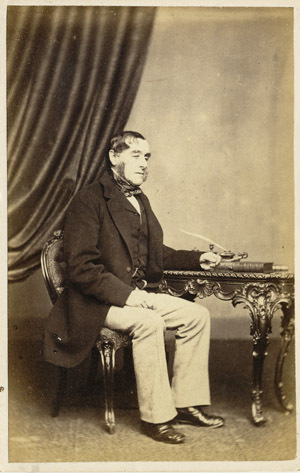 There is evidence that Joseph Langridge worked as a Railway Statistician and Accountant for the London, Brighton and South Coast Railway between 1846 and 1848. [ABOVE] An official notice of the court proceedings against Joseph Langridge, an insolvent debtor, published in a local newspaper in February 1851. Joseph Langridge is described in the notice as a former "Bread and Biscuit Baker", who is currently "out of business". ( Hastings & St Leonards News, February 1851). In his twenties, Joseph Langridge junior borrowed heavily to invest in a jewellery business and purchase railway shares. In 1835, at the age of twenty-three, Joseph Langridge junior established a jeweller & silversmith's shop at his father's premises in Meeting House Lane. Two years later, Langridge expanded his business by acquiring two more shops in Brighton, one at 15 North Street, the other at 71 King's Road. The sums of money that were laid out in Rennie's Direct London and Brighton Railway by Joseph Langridge were considerable. In 1836, Joseph Langridge had invested a total of �3,000 In Rennie's London to Brighton Railway, and the following year he had purchased railway shares totalling �1,875. In partnership with Mr Ewen Evershed (1805-1889), a solicitor and Clerk to the County Court, Langridge had jointly borrowed �1,300 to purchase railway shares. When in January 1842, Langridge "took advantage of the Insolvent Debtors Act", Mr Evershed was named as creditor who was owed �700. It appears that Joseph Langridge had also borrowed money from his business partner Edward Weston, when he set himself up as a "Jeweller, Goldsmith, Watch Maker and Practical Optician" at 15 North Street and 71 King's Road, Brighton. When Joseph Langridge junior, jeweller of Brighton, was declared an "insolvent debtor" in August 1842, Edward Weston was listed as a creditor. When Joseph Langridge's third daughter Kate was baptised on 9th March 1845, her father described himself as a "jeweller" residing at North Gardens, Brighton. By the time his youngest daughter Lucy Ellen Langridge (born 1846, Brighton) was baptised at the Chapel Royal on 31st March 1847, Joseph Langridge was living at 6 Middle Street, Brighton and working as a "Railway Statistician". By this date, the London to Brighton Railway Line had been completed ( the London to Brighton Railway was opened on 21st September 1841) and was being operated by the London, Brighton and South Coast Railway. In the 1840s, a "railway statistician" would analyse data from railway ticket sales, etc. and prepare reports on how the railway was working. By March 1848, Joseph Langridge and his family had moved to London. On 4th March 1848, Joseph Langridge started a bakery business at No. 3 Thayer Street, Manchester Square, London. Langridge later revealed that it cost him �500 to set up the bakery business in Thayer Street. ("I then possessed �200 capital. I borrowed capital to the amount of �300"). The following year, Joseph Langridge set himself up as a "Bread and Biscuit Baker" at a second shop at 27 Coventry Street near London's Piccadilly Circus. By November 1850, Langridge had disposed of both bakeries. At the end of 1850, Joseph Langridge was residing at 147 High Street, Camden Town, London and was described as "out of business". Langridge was receiving financial help from his wife's father, Thomas Ansell. Joseph Langridge later admitted that in March 1850 he borrowed from his father-in-law, Thomas Ansell, a sum of �300, which he "paid to various peoples". At the start of 1851, Joseph Langridge and his family were back in Brighton. Joseph Langridge had taken occupation of 173 Western Road, Brighton, a building that had been previously used as a school by a school mistress named Miss Shaw. It appears that Langridge was planning to re-open the school at 173 Western Road, with his wife Mrs Annie Langridge taking the role of School Mistress. Before Joseph Langridge was ready to open the school at 173 Western Road, Brighton, he was arrested as an "insolvent debtor". Ewen Evershed - a former business partner and one of Joseph Langridge's creditors - had requested the legal apprehension of Langridge after several frustrating years of trying to recover from Langridge the money he was owed. 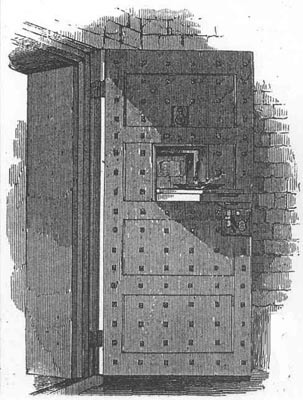 [ABOVE] An extract from The Jurist, noting that Joseph Langridge the younger, of Brighton, Sussex, currently "out of business", was in the Gaol of Lewes. (The Jurist, 8th February 1851, page 45). On 8th February 1851, the legal journal "The Jurist" noted that Joseph Langridge the younger of Brighton, Sussex, described as "out of business", was in the Gaol of Lewes waiting to be brought up before the Court as an "insolvent debtor". 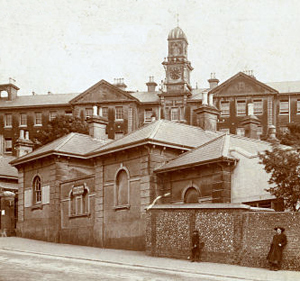 In 1851, the Gaol of Lewes was not the Victorian building on Brighton Road, Lewes, now known as HM Prison Lewes, but an 18th Century building in North Street. The Lewes Gaol in North Street was built in 1793 as a "House of Correction" and after HM Prison Lewes was constructed in 1853, it was sold to the Admiralty to be used as a Naval Prison. 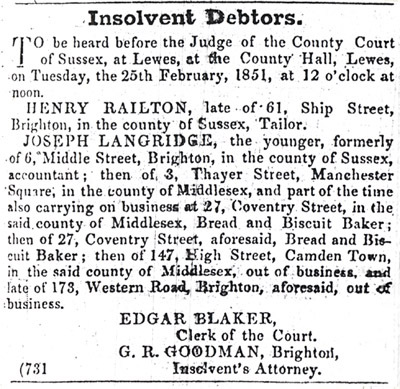 The case against Joseph Langridge junior, insolvent debtor, late of 173 Western Road, Brighton, was heard before William Furner, Judge of the County Court of Sussex, at the County Hall, Lewes, on 25th February, 1851. "Joseph Langridge the younger, of Brighton", was represented by an attorney, George Robert Goodman, a solicitor of Ship Street, Brighton, and was opposed by Mr William Kennett on behalf of the detaining creditor Mr Ewen Evershed. Another creditor, Mrs Buckman, was represented by George Faithfull, a solicitor who had served as Brighton's Member of Parliament between 1832 and 1835. Joseph Langridge outlined the financial difficulties he had experienced over the previous twelve years. In 1838, together with his business partner Mr Evershed, Joseph Langridge had jointly borrowed �1,300 to purchase shares in the London to Brighton Railway. Langridge had executed a deed of assignment for Mr Evershed's security, but in 1842, Langridge's watch-making business had gone bust. Owing Mr Evershed a sum of �700, Langridge had taken advantage of the Insolvent Debtors Act. In 1848, Langridge had again borrowed money to set up two bakeries in London. In May 1848, Langridge faced further legal action from creditors. Langridge told the Court he was obliged to sell the baker's shop in Thayer Street for �400, instead of the true value of one thousand pounds. Mr Kennett, on behalf of Mr Evershed, pointed out that when Langridge sold his bakery business in 1849, he had made a profit of �600 and was technically solvent. In November 1850, Langridge had disposed of some property for about �500. The sums of money Langridge had raised were not passed to his creditors, but paid to his brother-in-law, Mr William Faithfull. (Explaining his payments to William Faithfull, Langridge explained that he "was under considerable obligation to him"). Mr Kennett responded by pointing out that out of the "large profits" the insolvent had "realised from his business", Langridge had "never paid Mr Evershed a single farthing - the only person benefited at all was his own relative." [Brighton Gazette, 27th February 1851, page 8]. The Court heard that "it was evident that he (Langridge) was an educated person" and that the actions of the "insolvent" had "not been that of a needy man struggling with difficulties". Summing up, the Judge announced "he very much regretted to see a person, in so respectable station of life, in such a position." Joseph Langridge was found guilty of exhibiting a "vexatious defence" and giving "undue preference to creditors" and sentenced to 10 months imprisonment in Lewes Gaol. When the census was taken on 30th March 1851, Joseph Langridge was recorded as an inmate of the North Street County Prison in Lewes. Joseph Langridge is entered on the census return as a "Baker (Insolvent)", aged 38. "I have lately been residing at 173 Western Road, Brighton. I resided there at the time of my arrest ... I took the house of Miss Shaw, who carried on the business of a school mistress. I took the furniture of Miss Shaw, but not the school. I will swear that my wife was not carrying on the school at the time of my arrest. Miss Shaw turned the school over to another party. My father-in-law, Mr Thomas Ansell purchased the furniture." Under questioning, Joseph Langridge declared : "No prospectuses were issued by my wife describing herself as a mistress of the school before my arrest. The circulars were not printed." Despite his denials, there is evidence that Langridge was indeed planning to set up a school with his wife, Mrs Annie Langridge, at 173 Western Road, Brighton. The 1851 Post Office Directory of Sussex lists Mrs J. Langridge of 173 Western Road, Brighton under the heading of "Schools" in the Trades' Directory and the General Directory records a "Mrs Jane (sic) Langridge" with a "ladies' school" at 173 Western Road. On 30th March 1851, the census records Joseph Langridge as an inmate of Lewes Gaol. The same census shows Langridge's thirty-one year old wife Annie Langridge as head of household at 173 Western Road, Brighton and is described by the enumerator as a "School Mistress". From 1852, trade directories list Mrs Annie Langridge's Ladies' School at 186 Western Road, Brighton, yet she had not changed the location of the school - the new address was the result of a change in the numbering of the buildings in Western Road. Mrs Langridge was to run the Ladies' School at 186 Western Road, Brighton until her husband established a photographic studio in the same building around 1855. On his release from prison, Joseph Langridge established a soft drinks business at 203 Western Road, Brighton, just a dozen doors away from his wife's ladies' school at No.186 Western Road. 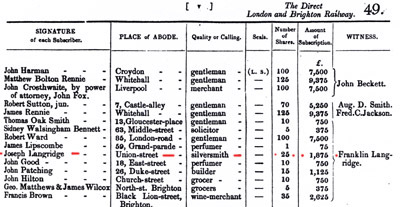 In Folthorp's 1852 Directory of Brighton, Joseph Langridge is listed as a "Soda Water Manufacturer" at 203 Western Road, Brighton, but there is evidence that Langridge also produced bottles of ginger beer from this address (see panel on the right). A notice placed in the Brighton Herald on 22nd October 1853, advertising "Brighton Bloaters" (smoked herrings) available from "J. Langridge, 203 Western Road", indicates that Langridge was diversifying his business interests. A further advertisement for Langridge's "Brighton Bloaters", which appeared in the Sussex Advertiser on 5th November 1853 details the seller as "Joseph Langridge, Fish Curer" of 203 Western Road, Brighton. W. J. Taylor's "Original Brighton & Hove Commercial Directory, issued in July 1854, lists "Joshua (sic) Langridge" as a "soda water manufacturer" at 203 Western Road, Brighton and makes no mention of his fish curing business. [ABOVE] An advertisement for "Brighton Bloaters" placed in The Brighton Herald by Joseph Langridge, of 203 Western Road, Brighton on 22nd October 1853. A "bloater" is a type of smoked herring, but, unlike the traditional "kipper", the bloater is not split and gutted, but smoked whole, giving the fish a stronger flavour. 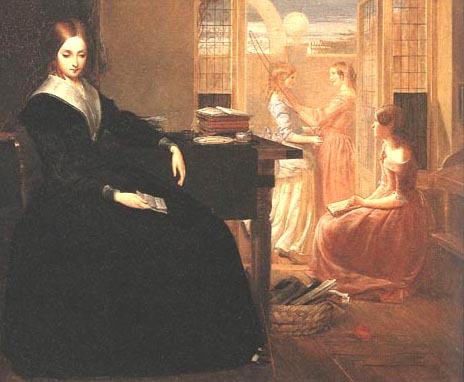 [ABOVE] A school mistress and her pupils, as depicted in Richard Redgrave's painting "The Poor Teacher" (1844). [ABOVE] An advertisement for "Brighton Bloaters" placed in the Sussex Advertiser on 5th November 1853 by Joseph Langridge, Fish Curer, of 203 Western Road, Brighton. [ABOVE] A Victorian stoneware ginger beer bottle impressed with the name "J. LANGRIDGE, BRIGHTON". This bottle has the pottery mark of the bottle maker "Stephen Green & Co. Lambeth - Patent double glazed.". Joseph Langridge produced ginger beer and soda water from his premises at 203 Western Road, Brighton between 1852 and 1853. In August 2001, Derek Barton, a collector of antique bottles, reported that he had in his collection a very rare stoneware ginger beer bottle impressed 'J. Langridge - Brighton', which he dated to the period 1852-54. (see photos, left and below). Derek Barton went on to say that only two or three examples of Langridge's ginger beer bottles are known to exist. Derek Barton noted that the stoneware bottle was unusual and bore the mark of the bottle maker 'Stephen Green & Co. Lambeth'. In 1977, Derek Askey, a bottle expert from Brighton authored a book entitled 'The Sussex Bottle Collectors Guide', in which he identified the ginger beer manufacturer as Joseph Langridge junior, a soda water maker with a shop at 203 Western Road, Brighton. [ABOVE] The occupants of houses in Western Road, Brighton, as listed in the Street Directory published in W. J. Taylor's "Original Brighton & Hove Commercial Directory, issued in July 1854. Mrs Annie Langridge was running a Ladies' School at 186 Western Road and her husband Joseph Langridge (wrongly printed as Joshua Langridge in Taylor's Brighton Street Directory) is shown as a "soda water manufacturer" at No. 203. 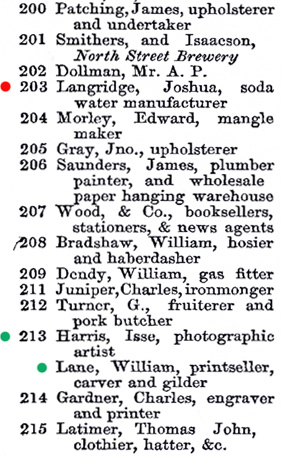 The only person described as a "photographic artist" on this page of the Street directory was Jesse Harris (misprinted as "Isse Harris") at 213 Western Road, Brighton. James Waggett, a pianoforte tuner at No. 193, Mrs Agnes Ruge, the wife of Dr Arnold Ruge, the German professor at No.180, and William Lane, printseller and carver & gilder at 213 Western Road, were all earning a living by taking photographic portraits within two years of the publication of Taylor's 1854 Directory. Sometime before September 1856, Joseph Langridge adopted the pseudonym of "Merrick" and established a photographic portrait studio at his residence at Regent House, 186 Western Road, Brighton. (see directory entry below). [ABOVE] An extract from Melville & Co.'s Directory and Gazetteer of Sussex (published in September 1858), showing Merrick & Co., photographists, at Regent House, 186 Western Road, Brighton, listed alphabetically in the "Trades & Professions" section of the Brighton Directory. The photographic studio of Merrick & Co. at 186 Western Road, Brighton made its first appearance under the heading of "Photographic and Talbotype Galleries" in the 1856 edition of Folthorp's Brighton Directory (corrected to September 1856). [ABOVE] An extract from Melville & Co.'s General Directory of Brighton, published in 1858, showing Joseph Langridge as a photographer at 43 Clarence Square, Brighton. The local trade directories published during this period list the firm of Merrick & Co. as photographic artists at 43 Clarence Square and 33 Western Road, Brighton. When Joseph Langridge was released from Lewes Gaol at the end of 1851, there was only one photographic portrait studio in Brighton - The Photographic Institution at 57 Marine Parade, Brighton. 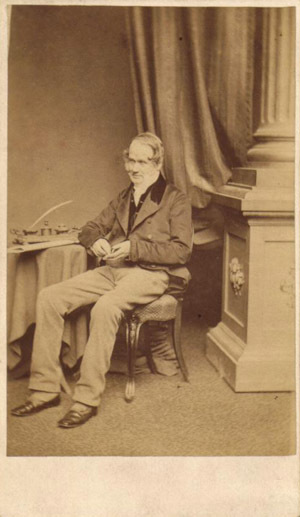 The proprietor of The Photographic Institution was William Constable (1783-1861), who, in 1841, had purchased a licence to take daguerreotype portraits in Brighton. Holding an exclusive licence from the owner of the daguerreotype process, William Constable had a virtual monopoly in the production of photographic portraits in Brighton during the dozen years between November 1841 and 14th August 1853, the date when the daguerreotype patent expired. William Constable's monopoly in the production of photographic portraits was briefly challenged in the Summer of 1852 by Joseph Meurant, a French daguerreotype artist from Paris and William Lane (1818-1889), a picture frame maker who made photographic portraits on glass using the recently invented "wet collodion" process. Joseph Langridge, who operated as a "soda water manufacturer" and "fish curer" from business premises at 203 Western Road, Brighton, could not fail to notice that three of the photographic portrait studios were located in Western Road. Mrs Agnes Ruge, the wife of German professor Dr. Arnold Ruge, was taking daguerreotype portraits at their family home at 180 Western Road, only six doors down from Langridge's own residence at 186 Western Road, then used as a ladies' school by his wife, Mrs Annie Langridge. Sharing premises at 213 Western Road, were two photographic artists, Jesse Harris (1825-1892) and William Lane (1818-1889), the carver & gilder who had been taking photographic portraits on glass since September 1852. By 1856, James Waggett (1818-1888), a pianoforte tuner by trade, was taking photographic portraits at 193 Western Road, Brighton. Sometime before September 1856, Joseph Langridge established a photographic portrait studio under the name of Merrick & Co. at Regent House, 186 Western Road, Brighton, a building that had previously been used as a "Ladies' School" by Langridge's wife, Mrs Annie Langridge. 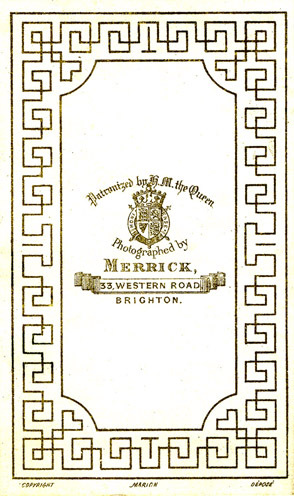 Perhaps because of his previous financial difficulties experienced under his real name of Joseph Langridge, the founder of the studio at 186 Western Road, Brighton, decided to operate under the studio name of "Merrick" (a name derived from his mother's maiden surname of "Merricks"). The photographic studio of Merrick & Co. at 186 Western Road, Brighton made its first appearance under the heading of "Photographic and Talbotype Galleries" in the 1856 edition of Folthorp's Brighton Directory (corrected to September 1856). Melville & Co.'s Directory and Gazetteer of Sussex of 1858 also lists Merrick & Co. as "photographists" at Regent House, 186 Western Road, Brighton. However, Melville & Co.'s Directory of Brighton, published in 1858, records Joseph Langridge as a photographer at 43 Clarence Square, Brighton. This is clear evidence that by 1858, Langridge had shifted his business operation from 186 Western Road, Brighton to premises that spanned 43 Clarence Square and the connecting shop at 33 Western Road, Brighton. Folthorp's Brighton Directory of 1859 lists Merrick & Co. as "Photographic Artists" at 33 Western Road & 43 Clarence Square, Brighton. Another entry in Folthorp's Brighton Directory of 1859, provides a small clue to the real identity of the proprietor of Merrick & Co. The "Street Directory" section of Folthorp's Brighton Directory lists the occupant of 43 Clarence Square, Brighton as "Joseph L. Merrick", yet Melville & Co.'s Directory of 1858 had recorded Joseph Langridge as the "photographer at 43 Clarence Square, Brighton. The 1861 census also clearly shows Joseph Langridge, described as a 48 year old "Photographic Artist", as the occupant of 43 Clarence Square, Brighton. All the evidence suggests that "Merrick" was the pseudonym of Joseph Langridge. No person with the surname of Merrick is recorded in the 1861 census of Brighton and the only Merrick that appears in Brighton street and trade directories during the period of Joseph Langridge's involvement in photography is "Merrick & Co." The business addresses of "Merrick & Co." published between 1856 and 1873 correspond to the residences of Joseph Langridge and his family during the same period. Joseph Langridge's Photographic Studio at 33 Western Road and 43 Clarence Square, Brighton, trading under the name of "Merrick & Co."
[ABOVE] A modern photograph of the houses that line the north side of Clarence Square, Brighton, which back on to the main shopping street of Western Road (2009). 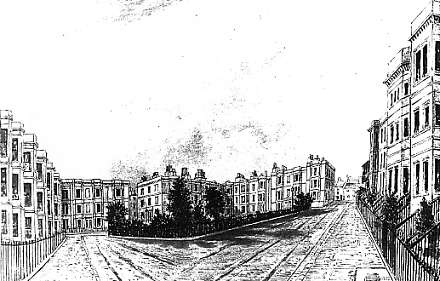 By the 1820s, the gardens of the houses pictured above provided the site of shops on the southern side of Brighton's Western Road. The shops and businesses which run from 50 to 28 Western Road are backed by the houses which line the north side of Clarence Square, numbered between 26 and 46. ( The 'Prince of Wales' public house house is located at 47 Clarence Square, Brighton). Between 1858 and 1873, Joseph Langridge's photographic studio and residence was jointly located at 33 Western Road and 43 Clarence Square, Brighton. 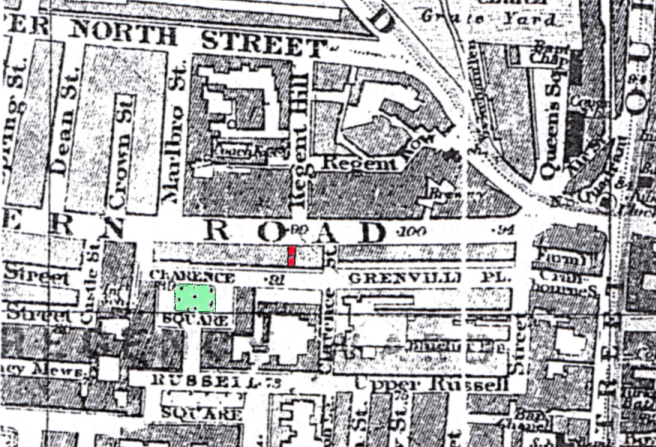 [ABOVE] A detail from a Victorian map of central Brighton showing the location of Joseph Langridge's photographic studio and residence at 33 Western Road and 43 Clarence Square, Brighton. Around 1858, Joseph Langridge moved his photographic studio to No.33 Western Road, Brighton. Joseph Langridge and his family had recently moved into a house at 43 Clarence Square, Brighton. The houses on the north side of Clarence Square, where Langridge's home was situated, had been built around 1807 as Clarence Place. By the 1820s the gardens behind the Clarence Place houses provided the site for a row of shops on Western Road. Between 1847 and 1852, more houses were built dirctly opposite and to the sides of Clarence Place, forming Clarence Square. The houses on the north side of Clarence Square backed on to the parade of shops that lined the south side of Western Road. In effect, Joseph Langridge's house at 43 Clarence Square formed the rear entrance to the photographic studio at 33 Western Road. 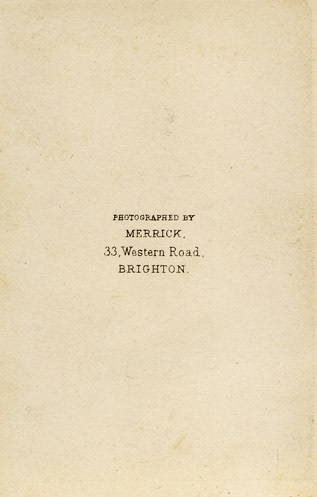 Consequently, Folthorp's Brighton Directory of 1859 lists Merrick & Co. as photographic artists at 43 Clarence Square and 33 Western Road, Brighton. [ABOVE] The trade plate of Merrick, photographer of 33 Western Road, Brighton, taken from the reverse of a carte-de-visite (c1862). "Merrick" was the pseudonym of Joseph Langridge (1812-1895), an entrepreneur and businessman who had taken up photography as a commercial venture around 1856. Langridge established a studio at 33 Western Road, Brighton around 1858. [ABOVE] A carte-de-visite portrait of an unknown man, photographed by "Merrick" at Joseph Langridge's photographic studio, 33 Western Road, Brighton (c1862). Joseph Langridge operated a photographic studio at 33 Western Road, Brighton, under the name of "Merrick", from around 1858 until 1873. Joseph Langridge's early photographic portraits taken in the late 1850s were probably 'collodion positives' on glass (known as 'ambrotypes' in America). However, by the early 1860s, Langridge's studio in Western Road was mainly producing photographic portraits pasted on small rectangular card mounts. Langridge was in charge of the photographic firm of Merrick & Co. during the height of "cartomania" - the period when there was an enormous popular demand for the small photographic portraits known as "cartes-de-visite". Invented in France in 1854, cartes-de-visite were small photographic paper prints on card mounts the same size as conventional visiting cards (roughly 21/2 inches by 41/4 inches or 6.3 cm x 10.5 cm). As this photographic format originated in France, a photographic portrait mounted on small card came to be known as a 'carte-de-visite', the French term for visiting card. 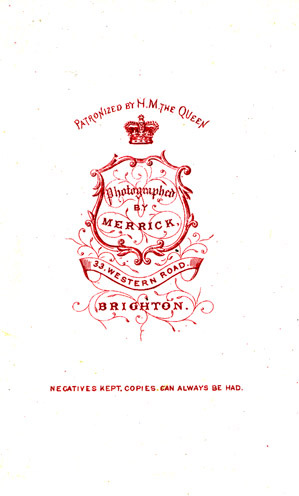 The Merrick photographic studio at 33 Western Road, Brighton was in business for around fifteen years. Langridge's firm of Merrick & Co. came to an end around 1873 and the photographic studio was acquired by Henry Dobney Hatch (born 1840, Oxford), a stationer and importer of foreign goods. Henry Dobney Hatch operated the studio at 33 Western Road under the name of "D'Aubigny Hatch" for about five years. Around 1878, the photographic studio at 33 Western Road, Brighton passed to Samuel Kay Balbirnie (born 1855, Kingsland, Hackney. London), who specialized in "Spirit Photographs" and other forms of "trick photography", including "Headless Photographs" - " ladies and gentlemen taken showing their heads floating in the air or in their laps". The photographic studio at 33 Western Road, Brighton eventually closed for business around 1880, when Samuel Kay Balbirnie left Brighton to enlist as a surgeon in the Royal Army Medical Corps . [ABOVE] A view of Clarence Square, Brighton, drawn in 1853 by William Alfred Delamotte (1775-1863). The row of houses on the right-hand side lined the north side of Clarence Square, which backed on to Brighton's Western Road. (See the photograph on the right). Joseph Langridge and his family resided at 43 Clarence Square, situated at the rear of his photographic studio at 33 Western Road, Brighton. Joseph Langridge's house at No. 43 would have been situated approximately where the house on the extreme right is shown. [ABOVE] A view of the parade of shops in Western Road which were built on the back gardens of the houses on the north side of Clarence Square, Brighton (c1905). 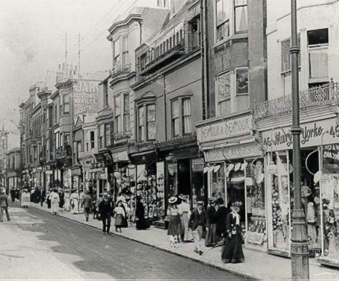 In the 1860s, the photographic studio of Merrick & Co. at 33 Western Road, Brighton would have been at the far end of the parade of shops pictured. Behind this parade of shops was the north side of Clarence Square, where Joseph Langridge resided with his family between 1858 and 1873. [ABOVE] Details of the photographic artist Joseph Langridge and his family taken from the 1861 census of Brighton. Joseph Langridge's private residence in Clarence Square, Brighton was connected to his photographic studio in Western Road. At various stages of his working life, Joseph Langridge had to call upon the help and assistance of his family. Joseph Langridge had two siblings, an elder sister named Mary Ann (born 1809, Brighton) and a younger brother, Franklin Langridge (born 1815, Brighton). Joseph's brother Franklin Langridge, a lawyer, had died in 1844, aged twenty-nine, at the home of his brother-in-law, William John Faithfull (1802-1877). In 1835, Joseph's sister Mary Ann Langridge had married William John Faithfull (born 1802, Westminster), then a solicitor's clerk, but later an influential Brighton solicitor. It was probably through the representations of his brother-in-law, William John Faithfull, that Franklin Langridge, the youngest son of a pawnbroker and second-hand clothes dealer, was able to enter the legal profession. Franklin Langridge became a legal clerk and became a fully fledged attorney when he was admitted to the Queen's Bench during the Easter Term of 1843. Sadly, Franklin Langridge died on 17th September 1844, at the age of 29, before his legal career could take off. William John Faithfull also provided support and financial assistance to Joseph Langridge, his wife's surviving sibling. It appears that William Faithfull had helped to finance Joseph Langridge's early business ventures and when, in 1851, Joseph Langridge appeared at the County Court as an insolvent debtor, he revealed that he "was under considerable obligation" to his brother-in-law, William Faithfull. Joseph Langridge had been criticised in Court for passing on sums of money to his brother-in-law, instead of paying his creditors. William Faithfull's uncle was George Faithfull, MP (1790-1863), a leading Brighton solicitor and Member of Parliament for Brighton between 1832 and 1835. George Faithfull was a political reformer and founder of the radical weekly newspaper The Brighton Patriot. Joseph Langridge's connection with the influential Faithfull family probably helped him establish a reputation as a fashionable Brighton photographer. Several of William Faithfull's clients sat for Joseph Langridge's camera at Merrick & co.'s studio in Brighton. 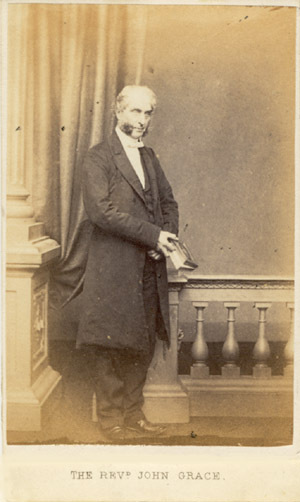 Reverend John Grace (1800-1865), a minister of the Baptist Tabernacle in West Street from 1847 to 1865, was photographed at Merrick's Studio at 33 Western Road, Brighton around 1865. It was possibly not a coincidence that Joseph Langridge's brother-in-law, the solicitor William John Faithfull provided legal services to Reverend John Grace, drawing up Reverend Grace's last will and testament on 10th February 1865. After Joseph Langridge established his photographic studio in Brighton in 1856, he was able to repay William Faithfull for his past assistance by taking on as photographers two of William's sons, William Faithfull junior (born 1838, Brighton) and Frederic Franklin Faithfull (born 1840, Brighton). 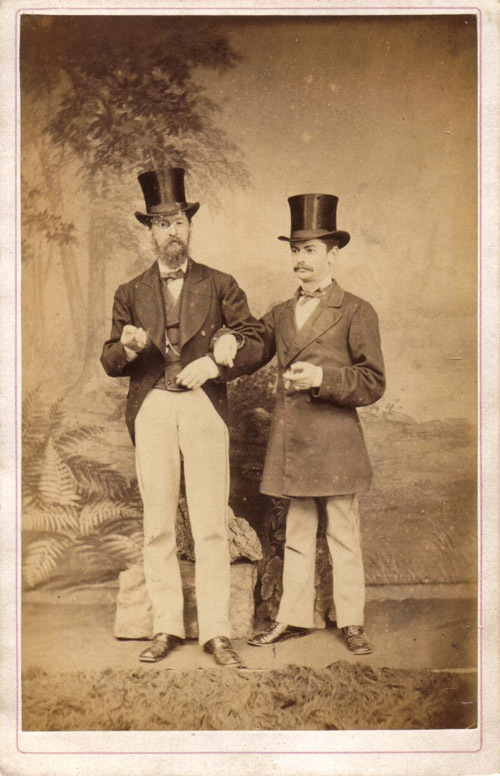 William Faithfull junior and Frederic Franklin Faithfull were to work as photographers in their uncle's photographic studio until Langridge sold the business in 1873. When the 1861 census was taken, William Faithfull junior was recorded as a twenty-two year old "Photographer" staying at the "Chichester Arms" inn at 110 North Lane, Brighton. William's younger brother, twenty-one year old Frederic Franklin Faithfull was residing at 24 Meeting House Lane, Brighton, the home of Joseph Langridge's parents Joseph and Mary Langridge. (Joseph Langridge senior was, at the age of seventy-eight, still working as a "Clothier" in the Lanes. Joseph Langridge's father died on 9th December 1863, aged 81). In 1867, Frederic Franklin Faithfull married Harriet Ann Bone (born 1839, Arundel, Sussex). Early in 1865, Harriet had give birth to a son, christened William John Edmund Bone and after her marriage to Frederic Faithfull, the boy took his father's surname. A second son, Frederic Franklin Faithfull was born in March 1871. When the census was taken on 2nd April 1871, Fred F. Faithfull, described as a thirty-one year old "Photographic Artist", was recorded at 33 Claremont Street, Brighton, with his wife Harriet and their two children, six year old William John Faithfull and the three week old baby Frederic Franklin Faithfull junior. By 1871, William Faithfull junior, Fred Faithfull's elder brother, had also taken a wife. William Faithfull, described on the census return as a "Photographer", aged 36 ( William was actually 32 when the census was taken) is shown living with a young woman named Maria (born c1845, Emsworth) at 58 William Street, Brighton. William John Faithfull died in Brighton on 7th November 1877, at the age of 39, but his brother Frederic Franklin Faithfull continued working as a photographer, even after Joseph Langridge disposed of his Brighton photographic studio and moved to Camberwell in South London. At the time of the 1881 census, Frederick F. Faithfull (now adopting the more usual spelling of his christian name) was recorded as a forty-one year old "Photographer" at 5 Elm Grove, Brighton. Frederick's wife Harriet was working as a dressmaker and their son William John Edmund Faithfull was employed as a domestic servant. Ten year old Fred Faithfull junior was still at school. Mrs Harriet Faithfull, Frederick Faithfull senior's wife, died in 1883 and when the 1891 census was taken Frederick Franklin Faithfull, a fifty-one year old widower, was living alone in Brighton. By the time the 1901 census was taken, Frederick Franklin Faithfull was an inmate of Brighton's workhouse. When the census return was completed, Frederick Franklin informed the enumerator that he was "formerly a photographer", which suggests he continued his photographic career until circumstances forced him into the workhouse. Frederick Faithfull died in the Brighton workhouse the following year. [The death of Frederick Franklin Faithfull was registered in Brighton during the First Quarter of 1902]. [ABOVE] A portrait of Brighton solicitor George Faithfull (1790-1863), a carte-de-visite portrait photographed at the Merrick photographic studio at 33 Western Road, Brighton (c1862). George Faithfull, who had served as Brighton's Member of Parliament during the 1830s, was a younger brother of William Dibsdale Faithfull (1774-1847). In 1835, Joseph Langridge's sister Mary Ann Langridge (1809-1894), married William Dibsdale Faithfull's eldest son William John Faithfull (1802-1877). [ABOVE] The Brighton Workhouse in Elm Grove, near Race Hill, where the photographer Frederick Franklin Faithfull died in 1902. 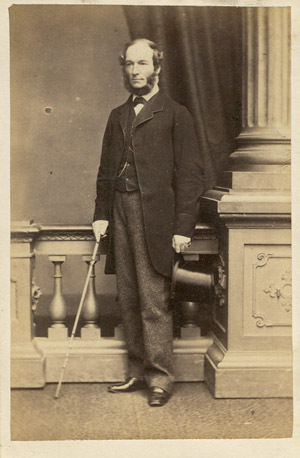 Frederick Franklin Faithfull (1840-1902), was Joseph Langridge's nephew and was employed as a photographer at the Merrick & Co. studio (owned by Langridge) during the 1860s and the early 1870s. Joseph Langridge used his family connections and his supposed patronage of the Royal Family, to establish a reputation for Merrick & Co. as a photographic studio which could cater to the needs of the visiting nobility, the local gentry, members of the clergy, and other distinguished personages. 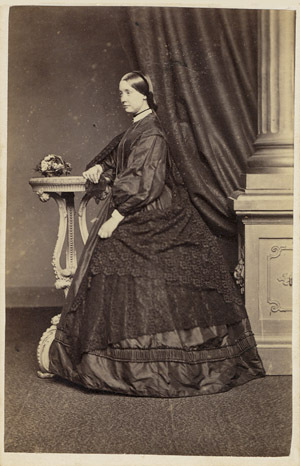 The high quality of the photographs taken at Merrick's Western Road studio suggests that Joseph Langridge had employed the services of a skilled and experienced photographer during the early 1860s. After 1862, the year that Queen Victoria had apparently commissioned Merrick & Co. to photograph Sarah Forbes Bonetta (a freed West African slave girl who had been educated at the Queen's expense - see panel below) Langridge was able to use the words "Patronized by H. M. the Queen" in his publicity. The use of the Royal Crest and the knowledge that Langridge's studio had been patronized by the Queen probably attracted customers from the higher ranks of society. 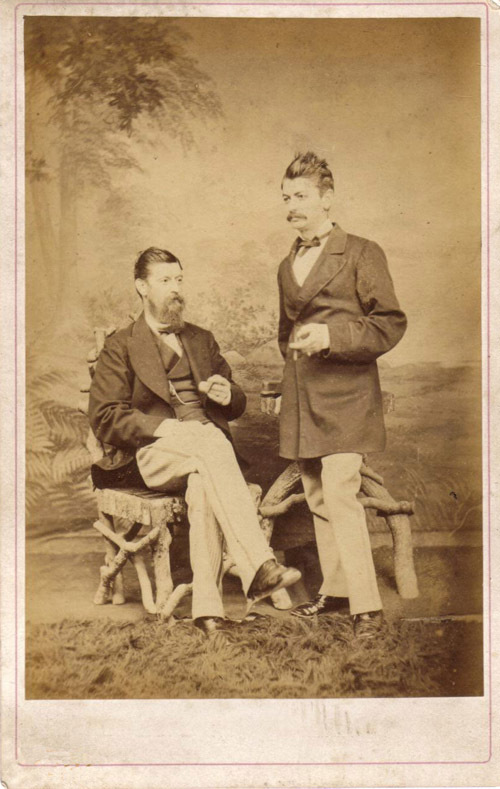 Identified sitters who posed for their portrait at Merrick & Co.'s studio in Western Road, suggests that many of Langridge's customers were from distinguished families. Named sitters include Sir George Jessel (1824-1883), a jurist who later became Solicitor General and Master of the Rolls, Hon. Augusta Anna Margaret Plunkett (1836-1907), daughter of the 12th Baron Louth, Reverend Edward Rowden (1780-1869) Vicar of Highworth, Reverend John Grace (1800-1865), Minister of Brighton's Baptist Tabernacle, George Faithfull (1790-1863), a leading Brighton solicitor and former MP for Brighton, and Reverend John B. Figgis (born c1838 Dublin), Minister at the Countess of Huntingdon's Chapel in Brighton. [ABOVE] A public notice placed in The Brighton Examiner on 24th February 1863 announcing that Merrick & Co.'s photographic studio at 33 Western Road, Brighton, would be closed for a few weeks so that some alterations could be made to the studio premises. In this advertisement, Joseph Langridge, in the guise of "Merrick & Co.", thanked "the nobility and gentry for their kind support", indicating the nature of the studios clientele. [ABOVE] The reverse of a carte-de-visite portrait by "Merrick" of 33 Western Road, Brighton (c1871). 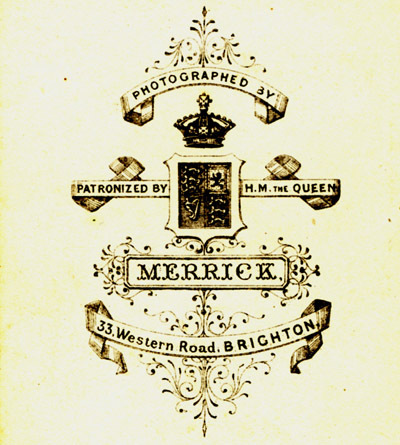 "Merrick" was the trade name of Joseph Langridge, who operated a photographic portrait studio at 33 Western Road, Brighton between 1858 and 1873. This back design, which includes a Royal Crest and the printed words "Patronized by H. M. the Queen", dates from around 1871. 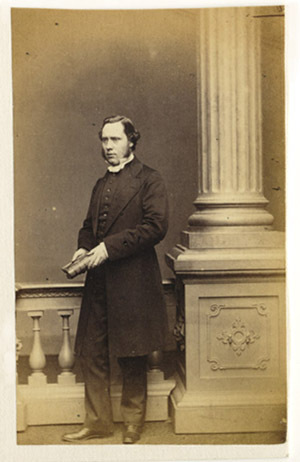 [ABOVE] A portrait of the Revd John Grace (1800-1865), a minister of the Baptist Tabernacle in West Street from 1847 to 1865, photographed at Merrick's Studio at 33 Western Road, Brighton (c1864). A "Memoir of the late John Grace" was published in 1865, the year of his death. In this memoir, Reverend Grace was described in glowing terms : "All who had the privilege of his friendship will long remember his open, cheerful, affectionate manner and address; his peaceable, tender spirit ... he was always ready to do good in relieving the poor and needy, and taking up any destitute case which was commended to his conscience". Ever since John Jabez Edwin Mayall (1813-1901) published his portraits of Queen Victoria and the Royal Family as a set of cartes-de-visite in 1860, there had been a great public demand for "celebrity cartes". The publication Mayall's set of Royal Album portraits started a fashion in Britain for collecting carte-de-visite portraits of famous people. Leading photographers of the day issued portraits of well-known personalities in the popular carte de visite (cdv) format, which were then sold through retail outlets such as print sellers, stationers, booksellers and 'fancy goods' shops. The retail trade dealt in photographs of members of the Royal Family, politicians, actors and actresses, novelists, artists, poets, musicians, entertainers and other famous celebrities. The people who collected these "celebrity cartes" would often keep them safe in the carte-de-visite albums which were specially designed to house these small card portraits. 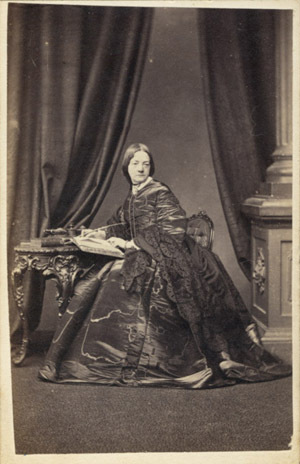 Portraits of Prince Albert, Benjamin Disraeli, Charles Dickens and the opera singer Adelina Patti appeared in carte-de-visite albums alongside photographs of the collectors' relatives and friends. Although the trade in celebrity cartes usually involved nationally known figures, there was a market for portraits of figures who were famous in the local community. For instance, photographic portraits of preachers and local clergymen were particularly popular in provincial towns. In 1862, William Hall (born c1826, Selkirk), a photographer with a studio at 13 St James Street, Brighton offered to the Brighton public, carte-de-visite portraits of twenty different local clergymen, advertised under the heading of "Eminent Ministers - taken from life." [ABOVE] A portrait of the Revd. John Benjamin Figgis ( 1837-1916), the Minister at the Countess of Huntingdon's Chapel in Brighton's North Street in the mid 1860s. A carte-de-visite portrait taken at the Merrick photographic studio at 33 Western Road, Brighton (c1865). John Figgis was educated at New College, London, and Trinity College, University of Dublin. Reverend Figgis was the the author of several evangelical and theological works including "Christ and Full Salvation" (1878), "Lessons Learnt in Italy and the Riviera" (1882) and "Manliness, Womanliness, Godliness " (1885). 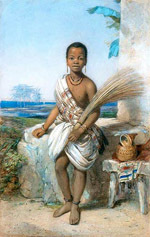 Ina (Sally Bonetta) pictured wearing traditional West African dress in a painting by Octavius Oakley (1800-1867) Ina Sarah Forbes Bonetta - already nationally famous as the "African Princess" - became a local celebrity in Brighton in 1862, when she was married at St Nicholas' Church, Brighton. Ina, who was believed to be the daughter of a tribal chief, was born in West Africa around 1843. When Ina was about five years old, her parents were killed during a raid by warriors from a neighbouring kingdom and she was taken into slavery. A few years later, Ina was one of the prized slaves held by the King of Dahomey. In June 1850, Ina was released from slavery when Gezo, the King of Dahomey, presented the young girl as a gift to Lieutenant Frederick Edwyn Forbes (1819-1852), the leader of an anti-slavery mission and the commander of the English ship HMS Bonetta. 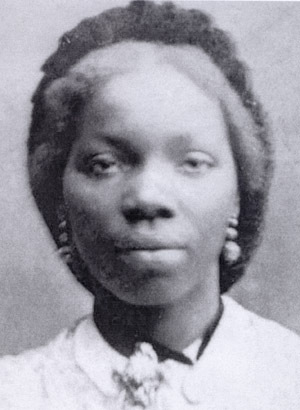 The eight year old girl was christened "Sarah Forbes Bonetta" - the middle name of "Forbes" in honour of the naval officer who had rescued her from slavery and "Bonetta" after the ship which was to bring her to England. "For her age, supposed to be eight years, she is a perfect genius; she now speaks English well, and has a great talent for music. She has won the affections, with but few exceptions, of all who have known her, by her docile and amiable conduct, which nothing can exceed. She is far in advance of any white child of her age, in aptness of learning, and strength of mind and affection." Queen Victoria took a special interest in the welfare of the young African girl. Fearing that the English climate was affecting her health, the Queen sent Sally Bonetta to West Africa to be educated at the Church Missionary School in Freetown, Sierra Leone. After 4 years of instruction at the Church Missionary School, Sally Bonetta returned to England. Lieutenant Forbes, Sally's former protector, had died in 1852, so Sally was fostered by Mr & Mrs Schoen of Gillingham, Kent, where her education was completed. 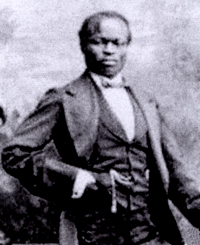 When Sarah Forbes Bonetta reached the age of seventeen, it was proposed, for the sake of her future protection and financial security, that she should marry a fellow West African, a wealthy merchant and Christian missionary named James Pinson Labulo Davies. Sarah refused to marry Mr Davies, stating in a letter that "I don't feel a particle of love for him & never have done so." To weaken her resolve, Queen Victoria arranged for Sarah to be removed from the care of Mr & Mrs Schoen and placed with two elderly spinsters in Brighton. 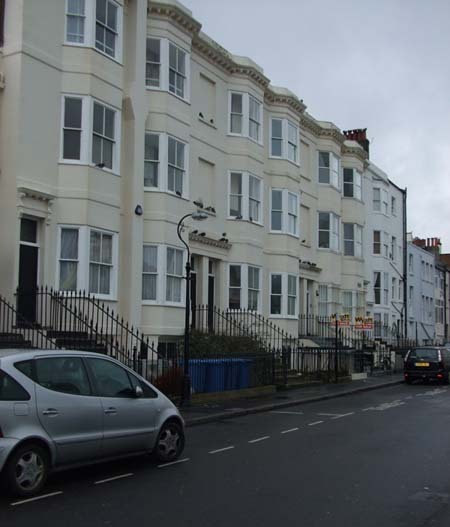 Sarah Forbes Bonetta was sent to live with seventy-four year Miss Hannah Welsh and her younger sister, sixty-six year old Miss Mary Welsh, at 17 Clifton Hill, Brighton. Feeling miserable and isolated in Brighton, Sarah eventually agreed to marry Mr Davies, the West African merchant. Sarah Forbes Bonetta married James Pinson Labulo Davies on Thursday 14th August 1862 at St Nicholas' Church, Brighton. As reported in the local press, it is clear that the wedding itself was a fantastic event attracting the attention of the inhabitants of Brighton. The Brighton Gazette described how the wedding party, travelling in ten carriages pulled by pairs of identical grey horses, made the journey from West Hill Lodge to St Nicholas' Church. 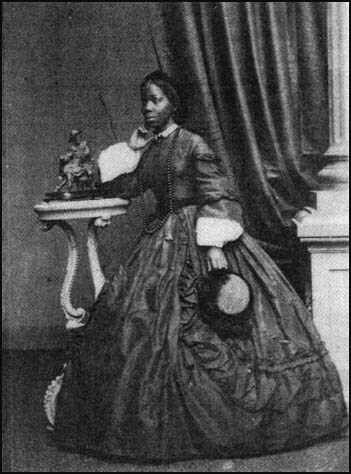 The young bride, Sarah Forbes Bonetta, then aged about nineteen, wore a white silk wedding dress and a head-dress of orange blossom, and was attended by sixteen bridesmaids. The Brighton Gazette reported how the the wedding party entered St Nicholas Church, "white ladies with African gentlemen, and African ladies with white gentlemen until all the space was filled". After the church ceremony, the guests attended a grand "wedding breakfast" in Brighton. Joseph Langridge, proprietor of the photographic firm of Merrick & Co. in Western Road, Brighton, had received a commission from the Royal Household to photograph Miss Sarah Forbes Bonetta soon after her arrival in Brighton. As a result of the great interest in "The African Princess" following her spectacular wedding in Brighton, Langridge arranged for the carte-de-visite photographs to be sold as pictorial souvenirs of the event. In September 1862, Merrick & Co, photographers, of 33 Western Road, were offering for sale, at 1s 6d a copy, a carte-de-visite portrait of Sally Bonetta Forbes, 'The African Princess', who had married Mr James Davies at St Nicholas Church, Brighton, the previous month. The firm of Merrick & Co. was keen to point out in its advertisements that Sarah Forbes Bonetta (now Mrs James Davies) had been photographed "by command of Her Majesty" (Queen Victoria). From this date, Joseph Langridge took the opportunity to print the legend "Patronized by H. M. The Queen" on the backs of his carte-de-visite portraits. Sarah Forbes Bonetta, who was now the wife of a wealthy West African merchant, travelled to Sierra Leone with her husband. After the birth of her first child, named Victoria in honour of the Queen, Sarah and her husband settled in Lagos, Nigeria, where two more children, Arthur and Stella, were born. Unfortunately, Mrs Davies, formerly "The African Princess", had contracted 'consumption' (tuberculosis of the lungs). Sarah re-located to Madeira in a vain attempt to recover her health, but sadly she died on the island in 1880 at the age of 37. [ABOVE] A portrait of Sarah Forbes Bonetta (aka Sally Bonetta Forbes) popularly known as the "African Princess". A detail of a portrait by the French photographer Camille Silvy (1834-1910) taken at his London studio on 15th September 1862, a month after her marriage in Brighton to James Labulo Davies, a West African merchant. [ABOVE] A portrait of Miss Sarah Forbes Bonetta, the "African Princess". 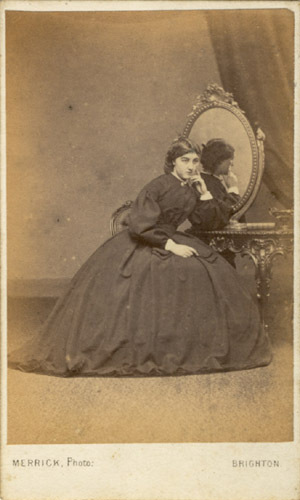 A carte-de-visite portrait taken at Merrick & Co.'s photographic studio at 33 Western Road, Brighton, before her marriage to James Labulo Davies in 1862. 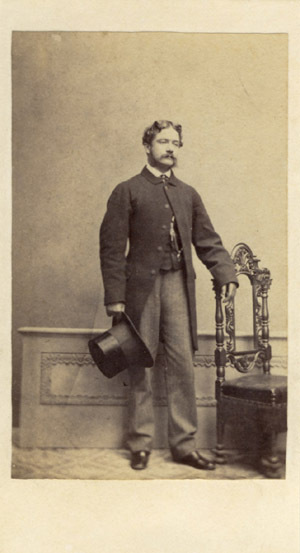 [ABOVE] A portrait of James Pinson Labulo Davies, photographed in London in 1862. [ABOVE] Details of the photographic artist Joseph Langridge and his family, taken from the 1871 census of Brighton. Joseph Langridge resided with his family at 43 Clarence Square, Brighton, for 15 years. [ABOVE] A carte-de-visite portrait of ayoung woman, photographed in front of a mirror by "Merrick" at Joseph Langridge's photographic studio, 33 Western Road, Brighton (c1864). Joseph Langridge's two youngest daughters, Kate Langridge (born 1845, Brighton) and Lucy Ellen Langridge (born 1846, Brighton) never married and lived with their father until his death in 1895. The marriage of Joseph Langridge junior and Annie Ansell produced four daughters - Annie Ansell Langridge (born 1840, Brighton), Mary Matilda Langridge (born 1842, Brighton), Kate Langridge (born1845, Brighton) and Lucy Ellen Langridge (born 1846, Brighton). It appears that Joseph Langridge's daughters provided assistance at his photographic studio in Brighton during the 1860s. Two of Joseph Langridge's teenage daughters - sixteen year old Kate and fifteen year old Lucy - are recorded as 'assistants' in his business when the census was taken on 7th April 1861. Mary Langridge, who would have been 19 in 1861, is not recorded in the Langridge household and was either working away from home, visiting relatives or living elsewhere under a married name. Another explanation is that Mary Langridge might have died young, sometime between the 1851 and 1861 census. Annie Ansell Langridge, a young woman of twenty-one, was living away from home at the time of the 1861 census, yet we know that she did not marry until 1863. Annie Ansell Langridge married Norman Thairp Stevenson in 1863. [The marriage was registered in Brighton during the 4th Quarter of 1863]. The couple produced a son known as Norman Stevenson junior (born c1865, Brighton). The following year, Annie gave birth to a baby girl, baptised Katharine Mary Simpson Stevenson at Brighton's Chapel Royal on 9th May 1866. By the time the 1881 census was taken, Joseph Langridge was residing with family members at 7 Wilton Terrace, The Grove, Camberwell, Surrey. It appears that Joseph Langridge was deriving an income from real estate - on the census return, Joseph Langridge gives his occupation as "owner of houses". Sharing Joseph Langridge's house in Camberwell was his wife Annie, his two unmarried daughters Kate and Lucy, and two grandchildren - Norman and Catherine (Katharine) Stevenson, the offspring of Joseph's eldest daughter Annie. Fourteen year old Catherine Stevenson was still at school, but Norman Stevenson junior was working as a clerk at the insurance firm of Lloyds of London. Annie's husband, Norman Thairp Stevenson appears to have died soon after the birth of their daughter. When the 1881 census was taken Norman and Catherine Stevenson were being cared for by their grandparents, while their mother Mrs Annie Stevenson, described as a forty year old widow, was working as a Housekeeper for the warehousing firm of Brown, Davis & Co. Limited at 11 & 12 Love Lane in the Aldermanbury district of London. Assisted by five young female servants, Mrs Annie Stevenson cared for the warehousemen who lodged at the Brown, Davis & Co.'s premises in Love Lane. Mrs Annie Langridge, Joseph Langridge's wife, died in Camberwell in 1882, at the age of sixty-two. After the death of his wife, Joseph Langridge continued to share his house with his two unmarried daughters Kate and Lucy. Joseph Langridge died in Camberwell in 1895, at the age of eighty-three. [The death of Joseph Langridge was registered in the London district of Camberwell during the 3rd Quarter of 1895]. Joseph Langridge's two youngest daughters never married. Miss Kate Langridge died in Camberwell in 1919 in her mid seventies and her sister Miss Lucy Ellen Langridge passed away in 1926 at the age of 80. [ABOVE] Details of Joseph Langridge and his family, as recorded in the census of 1881. By this date Joseph Langridge had abandoned photography and was living in Camberwell in South London, where he derived an income from the ownership of houses. [ABOVE] A portrait of a woman seated at a desk, photographed by "Merrick" at Joseph Langridge's photographic studio, 33 Western Road, Brighton (c1863). The subject of the portrait is not identified, but she is possibly a member of the Trenchard/Rowden Family. [ABOVE] The reverse of a carte-de-visite portrait by "Merrick" of 33 Western Road, Brighton (c1864). 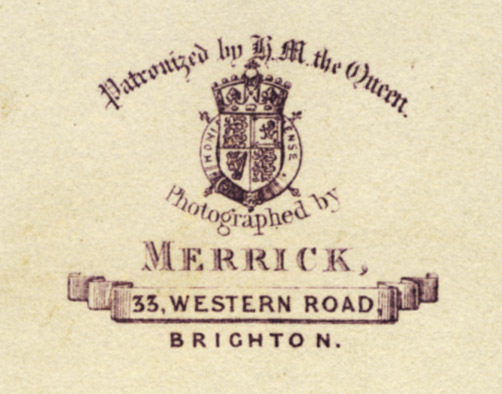 "Merrick" was the trade name of Joseph Langridge, who operated a photographic portrait studio at 33 Western Road, Brighton between 1858 and 1873. 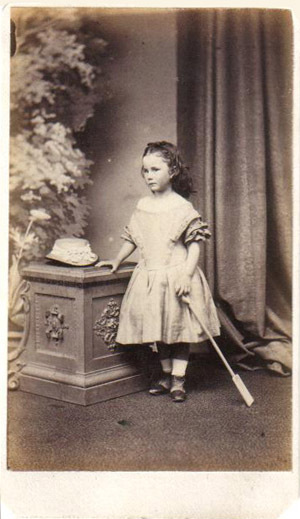 [ABOVE] A carte-de-visite portrait of a young girl standing by a plinth and holding a spade, photographed by "Merrick" at Joseph Langridge's photographic studio, 33 Western Road, Brighton (c1864). [PHOTO: Courtesy of Brighton History Centre] [ABOVE] A carte-de-visite portrait of a young woman, photographed by "Merrick" at Joseph Langridge's photographic studio, 33 Western Road, Brighton (c1863). The subject of the portrait is not identified, but she is possibly a member of the Trenchard/Rowden Family. [ABOVE] A carte-de-visite portrait of an unknown man seated by a writing desk, photographed by "Merrick" at Joseph Langridge's photographic studio, 33 Western Road, Brighton (c1864). [ABOVE] A carte-de-visite portrait of a man holding a top hat and walking cane, photographed by "Merrick" at Joseph Langridge's photographic studio, 33 Western Road, Brighton (c1865). 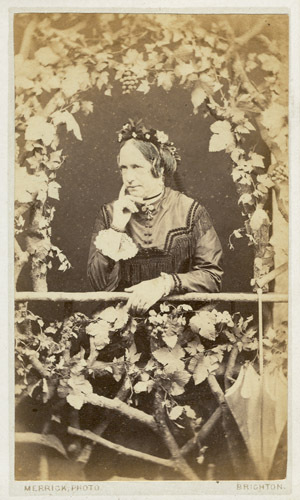 Inscribed in ink on the reverse "Mr. William Geary" [ABOVE] A carte-de-visite portrait of a middle-aged woman framed by a network of wooden branches, photographed by "Merrick" at Joseph Langridge's photographic studio, 33 Western Road, Brighton (c1873). [ABOVE] The reverse of a carte-de-visite portrait by "Merrick", 33 Western Road, Brighton (c1872). 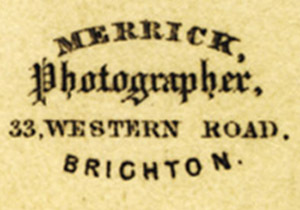 "Merrick" was the trade name of Joseph Langridge, who operated a photographic portrait studio at 33 Western Road, Brighton between 1858 and 1873. Thanks to Brian Faithfull of Lara, Australia, for providing information on the Faithfull Family of Brighton. I am grateful to Derek Barton for supplying information on Joseph Langridge's career as a ginger beer maker and for providing photographs of the stoneware bottle impressed with the name "J. Langridge". Newspapers and other Printed Primary Sources : The Brighton Patriot (12th May 1835) ; The List of Subscribers to The Direct London and Brighton Railway (published by The House of Commons on 7th March 1837) ; The Brighton Patriot (6th November 1838); The Jurist (8th February 1851) ; Hastings & St Leonards News (February 1851) ; Brighton Gazette, (27th February 1851) ;The Brighton Herald (22nd October 1853) ; Sussex Advertiser ( 5th November 1853) ; Brighton Gazette, 25th September 1862) ; The Brighton Examiner (24th February 1863) ; A "Memoir of the late John Grace" (May 1865). SECONDARY SOURCES : "At Her Majesty's Request: An African Princess in Victorian England" by Walter Dean Myers (Scholastic,1999) - an account of the life of Sarah Forbes Bonetta. "The Sussex Bottle Collectors Guide" by Derek Askey (1977), which contains information on Langridge's career as a ginger beer maker. Websites : Births, Marriages & Deaths Records on FreeBMD ; 1881 Census & International Genealogical Index on LDS Family Search. Census returns were also explored on the UK Census Collection featured on the ancestry.co.uk website, 1901 Census Online and the 1911 Census website. Digitized books on the American Libraries' Internet Archive website, the Open Library website and Google Books. David Faithfull's family history website Faithfull : Cousins and Connections. A good summary of the life of Sarah Forbes Bonetta, produced as part of Black History Month, can be found on the Kent Trust Web.